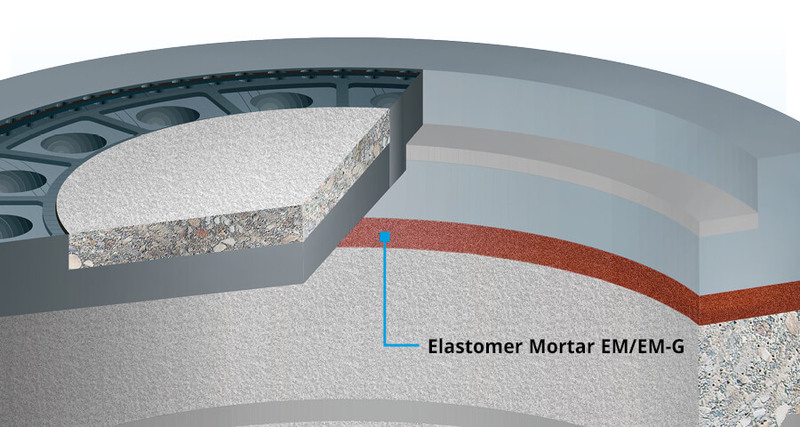 Two-component durable and permanently elastic plastic mortar for dynamically loaded joints. For highest levels of static and dynamic loads. High resistance against frost and de-icing salt. Quick reopening to traffic possible. DENSOLASTIC®-EM consists of a two-component polyurethane-based material with filler content. The material is available as a pourable version (EM-G) or as a spatula compound (EM). DENSOLASTIC®-EM is highly stable and permanently elastic after it hardens. The excellent material properties of DENSOLASTIC®-EM have been proven by official testing in independent testing laboratories. DENSOLASTIC®-EM is used for joints on components that are subjected to high levels of dynamic and static loading. 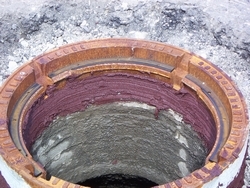 One example for use is as a joint mortar in channel and shaft seals, particularly on surfaces that are subjected to high static and/or dynamic loads. Due to its elasticity, DENSOLASTIC®-EM is noise and vibration-damping.